Market research firm Comres surveyed 2,002 British adults by telephone between 16 and 26 August. A miracle is regarded by many as a fortuitous event believed to have been caused by divine intervention, prayer or worship. As a practising Christian, Jemma Adams believes in miracles. "I'm an ex-drug addict" she explains. "At 17 I had crack psychosis and jumped off the top of a tower block and survived. Not only did I survive, but I didn't break one bone. " It was a miraculous experience, and evidence for her, that miracles are possible. She was sent to drug rehabilitation after her fall and began her journey to recovery. It has ended with her helping women who are in a similar situation to hers. Jemma worships at the Victory Outreach Church in Hackney, East London, where David Elwin is the pastor. David also has a history of drug-use, violence and spending time in prison. "Miracles are the foundation of a Christian's faith," he says. "The foundation of the Christian faith is the miracle that Jesus rose from the dead. It's vitally important that we maintain that as our foundation and our roots." Monsignor Peter Fleetwood, a Catholic hospital chaplain in Liverpool, says families will ask him to pray for a miracle to bring someone back from the brink of death. He believes in those cases a miracle would be a terrible thing because it would be prolonging a life that is already at its natural end. He also thinks you can be a Christian and interpret the miracles of Jesus in a different light. 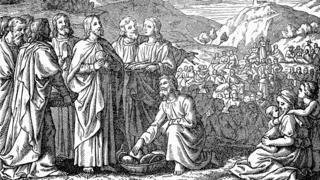 He uses the miracle of the feeding of the 5,000 - where Jesus fed a crowd with five loaves and two fish, as an example of how spontaneous generosity can cause a sense of wonder. "One explanation may be that he inspired people to share what they had with them in their baskets," he explains. "So rather than magically producing food, it's making food appear in another way. There are all sorts of ways it can be seen and still be wonderful." Both Jemma Adams and Father Fleetwood believe the best miracles are in the smaller things. "I see miracles every day," Jemma says. "I see women who were hopeless addicts get clean. A miracle to me is someone that was going to die, get hope again."